blasting out their honk step! Bossaphonik is firmly established as Oxford's hub for live jazz-dance and world-dance. Established in October 2004 by Dan Ofer and Gil Karpas, it has blossomed into a celebratory night and has played host to 100 great bands. It has become something of a movement and community of people passionate about quality of live music, and of course, dancing the night away. So come on down to The Cellar on any first Friday of the month and The Bullingdon on alternate months. Chill with your friends for the first hour while the DJs play nourishing music for the mind and soul, experience the energy of a wicked live band, then dance your socks off to the most tasteful global beats till the early hours! For May’s Bossaphonik night we have some home-grown talent onstage, hailing from Temple Cowley in Oxford, we’ll be welcoming Temple Funk Collective. 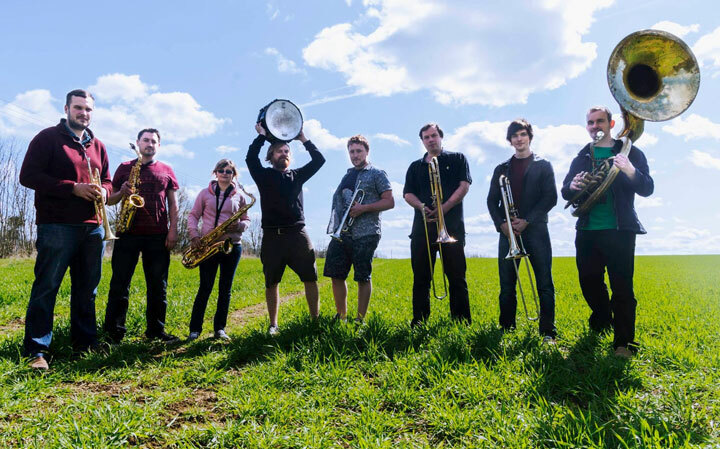 An 8 piece New-Orleans brass band riot who take lead from the Louisiana legends, they’ve trailed their own path since 2012 adding contemporary flavours of hip hop and jungle and some gypsy music. Mixing upbeat originals into a set of some classic covers with both clever and cheeky arrangements, Temple Funk are a band you can watch over and over again and always spot something new. They’ve electrified the stages of Glastonbury, Boomtown and Bestival and many other festivals and events with 2019 set to be another busy year with the release of the bands debut album. Temple Funk Collective also supply the horn power and drums behind the Dutty Moonshine big band – a collaboration with other artists to create one of the UK’s top electro-swing/grime/hip hop live acts. Following the band we have a late license for a Bossaphonik club session til 2am.